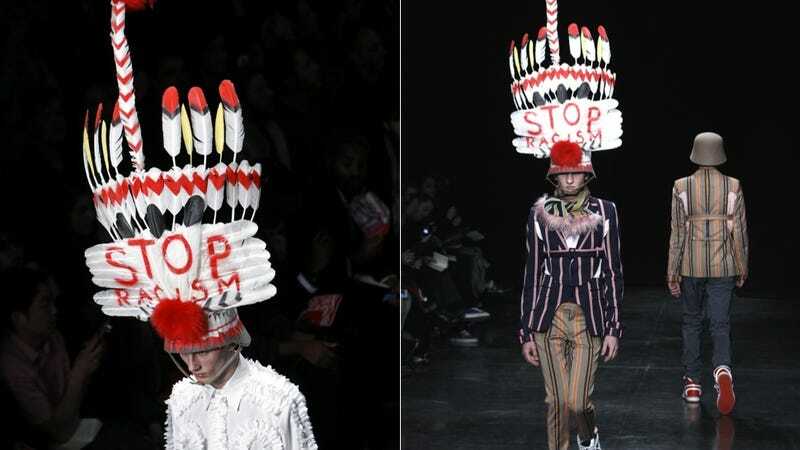 Well, here's a pretty clear way to articulate your disgust with the fashion industry's penchant for cultural appropriation: yesterday, as part of men's fashion week in Paris, Belgian designer Walter van Beirendonck sent two models down the runway in large headdresses that read "STOP RACISM." Appropriation occurs when bodies, typically white, popularize styles that didn't originate with them, across a matrix of power: the power of visibility, the power to define what is 'ethnic' in the market. The gains that follow are reserved for the appropriator, not the appropriated. When the participation of poc in mainstream culture is relegated to trinkets Urban Outfitters can sell, what are we supposed to do, be grateful? While our communities are mined for the latest hip accessories that are lauded on white bodies while suspect on ours, it's a valuation of whiteness above us. Above our history, dignity, and humanity. Of course, cultural appropriation is something the fashion industry has been hopelessly myopic about forever — Victoria's Secret, Urban Outfitters and Paul Frank, among others, have all recently been the subject of harsh criticism for engaging in the practice, knowing full well that other designers have been called out in the past. It's wildly refreshing to see the criticism coming from a fellow designer for once, and his message couldn't be much louder or clearer. The cartoonish headdress is a (pretty literal — just look at its shape) middle finger to everyone in fashion who refuses to learn from their mistakes — refuses, even, to recognize their mistakes as such. It's a wonderful and powerful message to send, and it's about time someone publicly called Lagerfeld out. With that said, though, it's pretty patently hypocritical to send a couple of white dudes down the runway wearing "STOP RACISM" on their heads in a show that had only 6 out of 41 looks modeled by men of color. So, yeah, the message is great, but its execution still serves as a continuation of fashion's race problem. Sigh. Lede images via AP; other images via Getty.